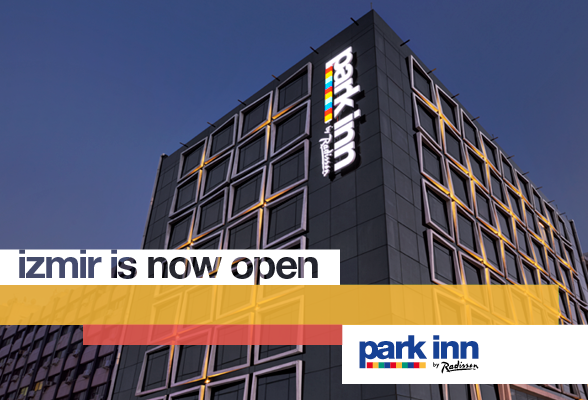 BRUSSELS, Belgium, 2017-Apr-12 — /Travel PR News/ — Park Inn by Radisson, the colorful and dynamic mid-market hotel brand, opens its doors on the Central Aegean coast of Turkey in Izmir. The Rezidor Hotel Group now has a portfolio of 23 hotels and 4,500 rooms in operation or under development in Turkey. “We are delighted to open our second hotel in Izmir, the third largest city in Turkey. Park Inn by Radisson Izmir will complement the Radisson Blu Resort & Spa Cesme, both collectively offering the global travelers a beautiful choice of upper upscale and mid-scale hospitality on the Aegean coast. We see a growing popularity for the Park Inn by Radisson brand as it delivers on its promise of an affordable hotel experience and a focus on all the essentials for the modern-day business or leisure traveler,” said Mark Willis, Area Vice President, Middle East & Turkey, The Rezidor Hotel Group. Park Inn by Radisson Izmir is conveniently located in heart of Izmir, in the Pasaport area and close to the major business district where embassies and international companies reside. The hotel is situated next to Izmir’s leisure attractions, including shopping malls and the famous Kordon, the city’s famous seafront promenade that offers stunning views of the Aegean Sea and a stretch of charming street cafes. Adnan Menderes International Airport is just 18 kilometers from the hotel, and public transportation options such as ferries, taxis, trains and buses make it easy for guests to explore the city. The hotel features 137 guest rooms and suites, some of them overlooking the beautiful Aegean Sea. Each room has been designed with comfort and a hassle-free experience in mind. The design elements are unique and include a choice of ceiling colors, a headboard with mood lighting and a colored shower screen. For dining options, the contemporary, all-day dining restaurant Live-Inn Room serves a selection of international and local cuisine. And for an inspiring start to the day, guests can enjoy the brand’s signature breakfast while taking in mesmerizing views of Izmir Bay from the hotel’s rooftop terrace. The modern lobby bar provides drinks and snacks in a relaxed environment. Innovative and dynamic spaces are at the forefront of meetings and events with Park Inn by Radisson. The hotel has four modern and flexible meeting room spaces that can be adapted to accommodate small meetings, training sessions or workshops, while the hotel’s rooftop terrace can be used for special events. The hotel also features a well-equipped gym and indoor parking. Guests get free high-speed Wi-Fi access throughout the hotel including meeting rooms. “Park Inn by Radisson, Izmir is a next generation mid-scale hotel that brings together a relaxed, fun and uncomplicated approach with a healthy dose of style. Guests can expect a great experience with the renowned warm Aegean hospitality delivered by our passionate team,” said Ahmet Arikan, General Manager of Park Inn by Radisson, Izmir. Izmir is considered the transportation hub in the western Anatolia region of Turkey and operates on a relatively new and highly developed infrastructure in transportation, telecommunications and energy. Izmir is a fast growing city with a population of approximately 3.7 million and has the second biggest port after Istanbul. Park Inn by Radisson is a part of Carlson Rezidor Hotel Group, which also includes Quorvus Collection, Radisson Blu®, Radisson®, Radisson RED, Park Plaza® and Country Inns & Suites By CarlsonSM. For more information and reservations, visit www.parkinn.com. Connect with Park Inn by Radisson on social media: @ParkInn on Twitter, @ParkInnbyRadisson on Instagram and Facebook.com/ParkInn. This entry was posted in Business, Hotels, Resorts, Travel, Travel Management, Travelers and tagged Ahmet Arikan, Izmir, Mark Willis, Park Inn by Radisson, Turkey. Bookmark the permalink.